There has been a Mobile Safari optimized version of Amazon.com for a long time now, and it’s a site I use a lot. I was extremely exicted to find out that Amazon has realesed a native application for the iPhone and iPod Touch. TUAW has a good write up about the app. One of the most interesting features is the “Remembers” feature. 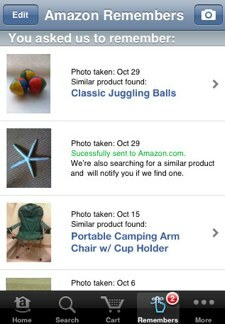 You can apparently take a photo of an object and upload it to Amazon. A couple mintues later you will be sent a link to the product. I’m not sure how they’re doing this, whether they’re licensing technology like TinEye or running the image to a bank of humans… but if it works as advertised, it will become an indespensible part of my shopping habits. I was very glad to see that Amazon has made it easy to add items to your wishlist. I use the wishlist a lot to keep track of items I’m interested in but I’m not ready to buy. I tried out the Remembers feature, and it really surprised me! 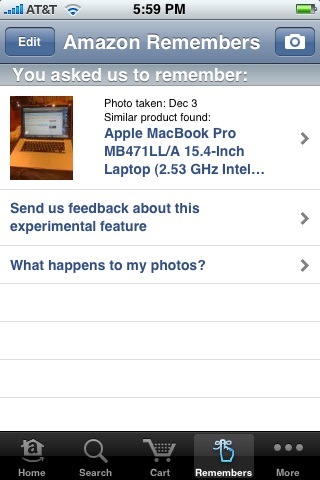 It recgonized my new 15″ Macbook Pro from a really poor photo I snapped. And it did it quickly. As Nathan mentioned in the comments, the Remembers system isn’t working off of any image recognition software or anything like that. Instead, it’s leveraging the Mechanical Turk system that Amazon launched not too long ago. Anyone can sign up to complete short tasks, such as looking at a picture submitted by the Amazon iPhone app, and returning the Amazon store URL. Check out more information at www.mturk.com. Interesting app. Don’t know if I’ll have much use for it, but I’ll be sure to try it out! Thanks for the head up Nathan. I’ll update the post to reflect that info soon. My most used apps right now are Brightkite (you’ll need a network of friends on it to be useful), Twitterific, RememberTheMilk, Palringo, Zenbe, 1Password, i.TV, and Bejeweled2. Thanks for the tips Chris! Sameer Vastas last blog post..The Bill Murray Effect.